Columbia Law School’s first-year students are given the unique opportunity to participate in moot court competitions at the beginning of their law school tenure. 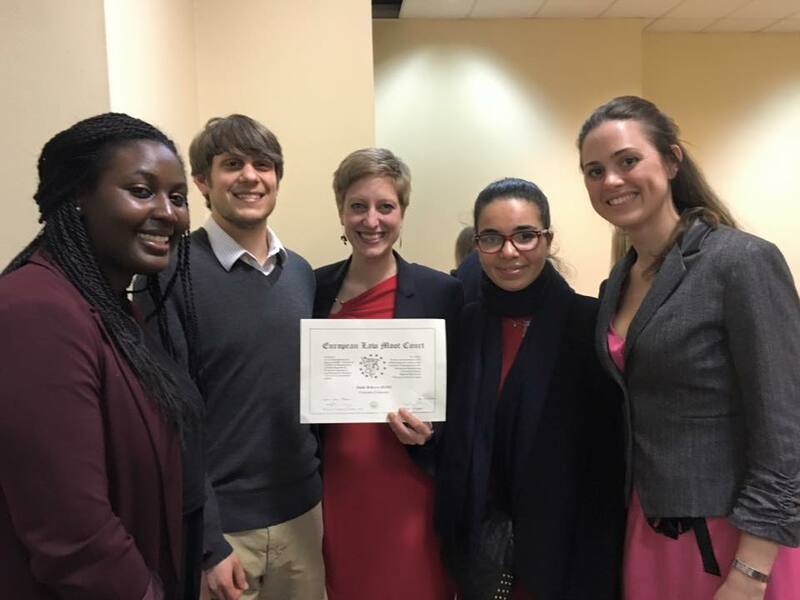 One of the international moot court programs with a strong tradition at CLS is the European Law Moot Court. On February 6, 2016, the team of César Rivere ’18, Eliana Sanchez ’18, Jake Bogart ’18, and Rachel LaFortune ’18 competed in a regional final at the University of Helsinki in Finland. The following weekend, the team of Ani Hamparsumyan ’17, Emily Hush ’18, Julie Nkodo ’18, and Kate Witchger ’18 competed at the National and Kapodistrian University of Athens in Greece. Both teams advanced to the regional semi-final round. Emily Hush, arguing as Representative of the European Commission for the Athens team, won the regional final for that role and will argue in front of judges of the Court of Justice of the European Union in Luxembourg on April 15, 2016. The two teams are coached by Caroline Ceriello ’17 and Aaron Rogoff ’17, respectively. Alexander Weaver, the Columbia Journal of European Law’s Editor-in-Chief for Volume 22, interviewed Emily Hush, the first-year student who will advance to the finals before the Court of Justice in Luxembourg. What is the European Law Moot Court (ELMC)? The ELMC is a competition centered around emerging issues in European law. For 1L students at Columbia Law School, it is a chance to practice written and oral advocacy. We were given a hypothetical problem centered around the EU emissions trading scheme, in which a company that failed to surrender their allowances by the deadline was hit with a penalty. Out of the situation came a conflict between the Court of Justice of the EU and the European Court of Human Rights. We had to argue before a panel of judges as the applicant, the defendant, and a third party Commission agent, who I represented at the competition. Is it common for American teams to participate in this competition? Some do. It’s not nearly as common as US teams participating in North American competitions, and the vast majority of entrants are European law students. There were a handful of North American schools that applied this year, but Columbia was one of few teams to advance to the regionals. Tell me more about the regionals. How many teams were there? What was the format? There are four regional finals in the competition. Columbia advanced two teams: one to the Helsinki regional, and my team and I represented CLS at the Athens regional. Each regional had twelve teams. The proceedings are scheduled in three rounds. In the first round, the applicant, defendant, and Commission agent scores are totaled for a team score. After that, the Commission agent is placed on a separate competition track. The applicants and defendants argue against each other. They have time to present arguments and rebut, and the Commission agent makes comments at the end. Arguments are presented in English and French, with points allotted to non-native speakers. There were six judges per room, twelve total. The judges were from all over. Some of them had worked at the Court of Justice or were currently working there. Others were professors or practitioners in various fields of law throughout the EU. To get to that stage you had to prepare a written brief, which formed the basis of selection for the regional? What were some of the challenges you had to face as a first-year law student preparing that brief? It began with an audition for the team in late September, after which we had to prepare a complete brief by late November. So we had seven or eight weeks to prepare the brief. It was a team brief, and the prompt was divided into four issues and two sides. We split the team of four people into two issues per person, per side. The biggest challenge for me was absorbing all of that information. We had never taken courses in EU law. We had never taken courses in any law! We had to come up with a logical, legally reasoned brief about topics we knew nothing about. We did a ton of research in the first few weeks to get ourselves up to speed. That was very exciting, but also our biggest challenge. Our coach, Aaron Rogoff, played a really important role, from taking care of all the administrative details, to keeping our spirits high and pushing us to achieve the best result we could. We couldn’t have done it without him! What was your reaction to the outcome of the regional? I was really pleased. They did not announce the winning Commission agent until after the applicant and defendant had completed their finals, in which the Commission agent did not participate. I only pleaded twice, while the winning applicants and defendants pleaded three times. After the long build-up, the announcement came as a big surprise. Now you get to compete in April before the Court of Justice in Luxembourg. How are you preparing? At the regional rounds, we fielded a lot of questions we did not expect. Each judge had their own area of concern. We were getting questions about tax law and other aspects of the prompt that we had not explored. Our research position now is that we need to cover all of those areas and go deeper into EU basics to ensure we have a broader knowledge of EU law generally. I am trying to master a wider range of case law so that I can cite cases for positions I might not take, but that I might have to take in response to specific questions from judges. When you only have ten minutes to speak you cannot address every issue which bears on the problem. I am trying to anticipate questions I might field and need to address. Does the whole team plan to travel to Luxembourg with you? We are very hopeful. This has really been a team effort from day one. The brief was a team brief. In Athens, we were researching together and helping each other. Even now we are meeting every week as a team. My three wonderful teammates, Kate, Ani, and Julie, have been researching questions to help me and they are mooting with me. We feel that this has been a team competition. I am not an individual participant, in that sense, representing Columbia. We are winning as a team. Do you have any future plans in European law? I am unsure yet. Coming from Canada, I am an international student with a strong interest in comparative law, and I do not know where that will take me professionally. I am really intrigued by the European approach to human rights. I wonder what would happen if the United States similarly had human rights laid out extensively in writing. I’d like to know how those ideas could translate here in the US, even without a written instrument.